The Spinsterhood Diaries: Coloring Page: Fruit! So, as you've probably guessed, I've been working on illustrations for the forthcoming coloring book for your summer vacation. Today I'm showing you another one of the illustrations. 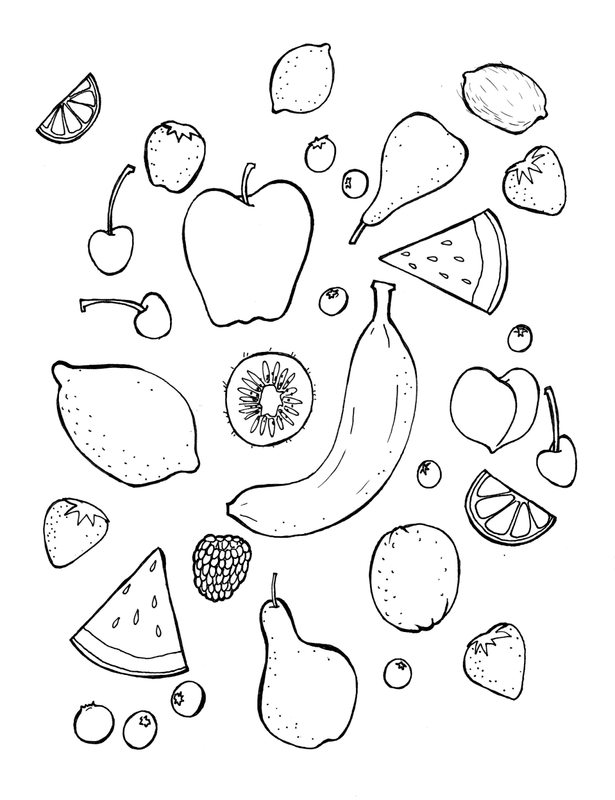 While fruit doesn't necessarily have anything specifically to do with Spinsterhood, I do think it's a good coloring page for summer. 1. Those little circles dotted throughout are supposed to be blueberries, but you can make them any color berries you like. 2. That hairy-looking lemon in the top right hand corner is supposed to be a kiwi. I think the sliced kiwi toward the center of the coloring page is more obvious, though. 3. That weird-looking one on the center right hand side is supposed to be a peach. I know what it is because I drew it, but in hindsight it looks a bit strange. Ok...I think three qualifies as "a few." Print this out on 8.5x11 paper and get yo' crayons out.